A terrorist attack at a luxury hotel and office complex in the Westlands area of Nairobi, Kenya has left 21 civilians dead and dozens more wounded or missing. Five attackers were also killed during the siege that began around 3pm on Tuesday, January 15th and ended just before 10am the next day. More than 700 people were safely evacuated during the attack. In a statement, the Somalia-based Al-Shabab group claimed the assault was retaliation for President Trump’s decision to recognize Jerusalem as the capital of Israel. The attack began at a bank inside the compound after a car bomb explosion ripped through three vehicles in the parking lot, followed by a blast from a suicide bomber in the lobby of the seven-story Dusit Hotel. The explosion triggered vehicles parked nearby to burst into flames. After the blast the remaining terrorists opened fire on guards, forcing them to open the gates of the complex at 14 Riverside Drive. Kenyan authorities believe there were four to six attackers armed with guns and grenades. Security camera footage released to local media outlets showed at least four armed men inside the complex as well as footage of the suicide bomber who calmly walked into the lobby and self-detonated a suicide vest. The coordinated attack lead to a standoff that continued through the night, with people trapped in various parts of the buildings hours later. The Recce company, the anti-terrorism unit of the Kenya Police, were sent in to combat the militants. A member of the British SAS and an unspecified number of United States Navy SEALs, who were in the country to conduct training, also took part in the response. Australian embassy security detail also exchanged fire with the terrorists as they made their way into the complex. According to Inspector General of Police Joseph Boinett, sixteen Kenyans, one Briton, one American and three unidentified people of African origin are among the dead and twenty-eight others have been hospitalized. Among the dead was U.S. businessman Jason Spindler, who in 2001 survived the September 11 attacks on the World Trade Center. He was co-founder and managing director of I-DEV International, a firm advising on business strategy for emerging markets. A British man is also among the dead and was later identified by the development organization Gatsby Africa as Luke Potter, head of its forestry and tea portfolio. A few of the victims identified in the attack were: James Oduor, who worked at one of the offices inside the complex. Oduor was trapped inside the complex in the hours after the initial blasts and sent out a tweet at 2:05am that read “Waaah. What’s happening at 14 Riverside fam? 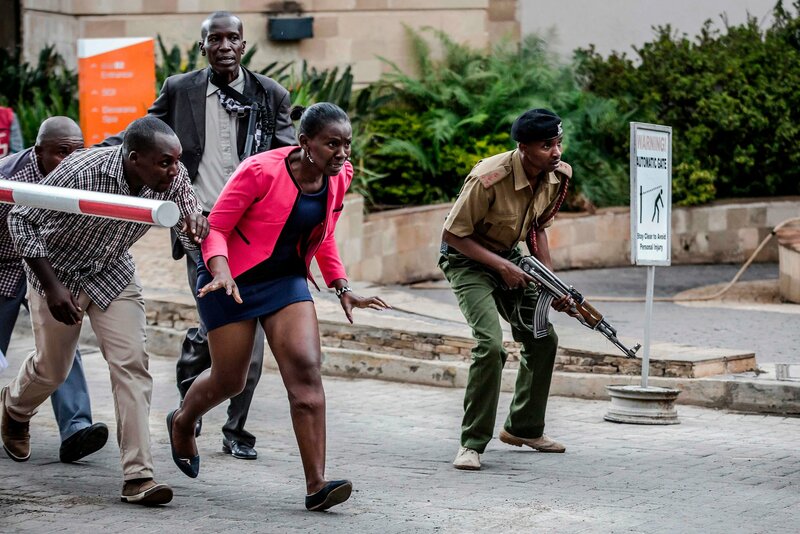 Any news from out there?” Another victim, Bernadette Konjalo, worked at the Dusit Hotel, and was shot as she ran away from an armed attacker after helping hotel guests find safety. Also killed were Kenyan development consultants Feisal Ahmed, 31, and Abdalla Dahir, 33, who worked for Adam Smith International (ASI). Described as “inseparable buddies’ by friends, the two were killed as they were having lunch at the Secret Garden restaurant in the grounds of the hotel when the suicide bomber struck. Mr Ahmed’s widow is reportedly seven months pregnant. After the attack, the militant group Al-Shabab, said “In a response to the witless remarks of US President Donald Trump and his declaration of Jerusalem as the capital of Israel,” the group targeted “Western and Zionist interests worldwide … in support of our Muslim families in Palestine.” In 2013, Al-Shabaab militants targeted the luxury shopping center of Westgate, which is 2 miles away from the site of Tuesday’s attack, killing 67 people in a siege that lasted several days. The group also killed nearly 150 people, most of them students, in an attack on Garissa University College in Kenya in April 2015.